The First Amendment of the US Constitution was adopted as part of the Bill of Rights in 1791. This “Great bulwark of liberty” provides that “Congress shall make no law respecting an establishment of religion, or prohibiting the free exercise thereof; or abridging the freedom of speech, or of the press; or the right of the people peaceably to assemble, and to petition the government for a redress of grievances.” In this conversation with professor Stephen Solomon we will explore the origins and drafting history of the First Amendment including: The inspiration from early state constitutions and declarations in Virginia and Pennsylvania The Articles of Confederation The fierce debate surrounding the Constitutional Convention and ratification process. How Federalists and anti-Federalists clashed over the necessity of a bill of rights How some Federalists used the Heckler´s Veto to silence anti-Federalists James Madison´s first draft bill of rights and why Madison thought that the American conception of freedom of speech differed substantially from the British conception Whether Freedom of Speech is really “the First Freedom” What were the essential justification for freedom of speech envisaged by the Founders Whether the Founders would agree with 21. Century standards of free speech as developed by the Supreme Court Why have kings, emperors, and governments killed and imprisoned people to shut them up? And why have countless people risked death and imprisonment to express their beliefs? Jacob Mchangama guides you through the history of free speech from the trial of Socrates to the Great Firewall. You can subscribe and listen to Clear and Present Danger on Apple Podcasts, Google Play, YouTube, TuneIn, and Stitcher, or download episodes directly from SoundCloud. Stay up to date with Clear and Present Danger on the show’s Facebook and Twitter pages, or visit the podcast’s website at freespeechhistory.com. Email us feedback at freespeechhistory@gmail.com.. . . In the second half of the 18th Century American, Patriots showed that freedom of the press was a potent weapon against authority. Not even the world´s most formidable empire could stop them from speaking truth, lies and insults to power. In 1765 the announcement of the Stamp Act kicked off a tsunami of dissent in colonial pamphlets, newspapers, taverns and town meetings. The outpouring of protest shaped a public opinion increasingly hostile to taxation without representation and in favor of popular sovereignty. Additional taxes and disabilities imposed by Parliament further radicalized the patriot side and the anti-British propaganda. The revolutionary dissent included both principled arguments, pamphlet wars, slander, and some genuine “Fake News”. Since prosecutions for seditious libel had effectively been abolished by the Zenger case in 1735 (see episode 21) the British were powerless to stop the onslaught of Patriot fighting words. More than ever press freedom had become the “Great Bulwark of Liberty”. Though Patriots constantly invoked the principle of freedom of speech, loyalist printers and newspapers were subjected to the “Patriot´s Veto” through intimidation and mob violence. Tom Paine´s pamphlet Common Sense became a sensation and pushed many Patriot fence-sitters into the independence camp. And just before and after the adoption of the Declaration of Independence, several states protected freedom of the press in rights declarations. In this episode we’ll explore: How a mix of ideas from classical antiquity and the European Enlightenment inspired the Founding generation How the democratization of access to print technology created a vibrant public sphere in colonial America How pamphlet wars were the 18th century equivalent of Twitter feuds How the Boston Gazette became the centerpiece of #theresistance and the launch pad for fighting words directed at the British and loyalists How symbolic speech such as liberty trees, liberty poles and cartoons rallied popular opinion How the Green Dragon Tavern in Boston became the “Headquarters of the Revolution” How newspapers used “fake news” and analog “photoshopping” to further the Patriot cause How loyalist printers were silenced through intimidation and mob violence with the tacit consent of prominent patriots like Tom Paine and James Madison How Tom Paine´s Common Sense steeled Patriots’ resolve and made the case for independence How the ideas of freedom of the press and speech were included in rights declarations of states like Virginia and Pennsylvania in 1776 Why have kings, emperors, and governments killed and imprisoned people to shut them up? And why have countless people risked death and imprisonment to express their beliefs? Jacob Mchangama guides you through the history of free speech from the trial of Socrates to the Great Firewall. You can subscribe and listen to Clear and Present Danger on Apple Podcasts, Google Play, YouTube, TuneIn, and Stitcher, or download episodes directly from SoundCloud. Stay up to date with Clear and Present Danger on the show’s Facebook and Twitter pages, or visit the podcast’s website at freespeechhistory.com. Email us feedback at freespeechhistory@gmail.com.. . .
18th century America was impacted and influenced by the so-called Glorious Revolution in the Motherland. And no-one had a bigger impact on American attitudes towards freedom of speech than Cato’s Letters written by the Radical Whigs John Trenchard and Thomas Gordon. Cato´s Letters created a powerful free speech meme, that went viral in the colonies: “Freedom of Speech is the great Bulwark of Liberty”. The reach of Cato’s principles grew exponentially as colonists liked, shared and commented on them in newspapers, pamphlets and taverns. Americans were persuaded that “Without freedom of thought, there can be no such thing as wisdom; and no such thing as publick liberty, without freedom of speech: Which is the right of every man”. As a consequence, grand juries and juries refused to indict and convict colonists for seditious libel when criticizing governments and officials. Despite the practical defeat of libels laws in colonial courts, legislative assemblies continued to threaten free speech. Under legislative privilege provocative writers could be jailed and fined by their own representatives. And even American heroes were sometimes willing to sacrifice principle. In this episode we’ll explore How coffee-houses expanded the public sphere by cultivating the sharing of news and ideas, including revolutionary ones. How the common law crime of seditious libel impacted writers How English writers including Matthew Tindal, John Trenchard and Thomas Gordon paved the way for American ideas on free speech How the editor of the New England Courant in Boston combined anti-vaxxer propaganda with free speech advocacy How the 16-year old Benjamin Franklin used Cato’s Letters to argue for freedom of speech when his brother James was in jail How the New York Weekly Journal became America’s first opposition newspaper and justified its savage hit pieces on New York governor William Cosby with Cato’s free speech principles How a jury acquitted the printer of the New York Weekly Journal Peter Zenger, even though he was guilty according to the law How legislative privilege was used to punish colonialists for offending their own representatives How Benjamin Franklin defended legislative privilege and the jailing of a Pennsylvania man for his writings You can subscribe and listen to Clear and Present Danger on Apple Podcasts, Google Play, YouTube, TuneIn, and Stitcher, or download episodes directly from SoundCloud. Stay up to date with Clear and Present Danger on the show’s Facebook and Twitter pages, or visit the podcast’s website at freespeechhistory.com. Email us feedback at freespeechhistory@gmail.com.. . .
Baruch Spinoza (also known as Benedict de Spinoza) was born in Amsterdam in 1632. While his given name means “blessing” in both Hebrew and Latin, Spinoza’s “Theological-political treatise” from 1670 was condemned as “a book forged in hell.” Spinoza himself was denounced as a dangerous heretic or atheist by religious and secular rulers alike, and was pilloried in the court of public opinion. Spinoza’s apparent crime consisted in systematically eroding the foundation of revealed religion and the authority of the Bible. But in addition to his materialist philosophy, Spinoza championed freedom of thought and expression as the precondition for social peace in a free democratic state. According to Spinoza, “The most tyrannical governments are those which make crimes of opinions, for everyone has an inalienable right over his thoughts” and therefore, “In a free state every man may think what he likes, and say what he thinks.” These were radical ideas in early modern Europe and too much to stomach for even the tolerant Dutch. 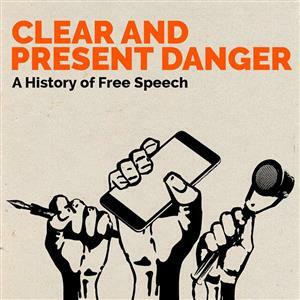 With me on this episode of Clear and Present Danger to explore Spinoza’s ideas on freedom of thought and expression is University of Wisconsin-Madison philosophy professor and Spinoza expert Steven Nadler. Nadler is the author of “Spinoza: A Life” and “A Book Forged in Hell: Spinoza’s Scandalous Treatise and the Birth of the Secular Age.” In the episode we discuss issues including: Why the Dutch Republic was tolerant and liberal compared to most other states at the time Why Spinoza was excommunicated from the Portuguese-Jewish community of Amsterdam Why Spinoza’s ideas of religion shocked and outraged just about everyone Why Spinoza thought social peace depends on freedom of thought and expression Where Spinoza drew the line when it comes to free speech and religion Bonus: Professor Nadler on Spinoza in New York Times: “Spinoza’s Vision of Freedom, and Ours” and “Judging Spinoza.” You can subscribe and listen to Clear and Present Danger on Apple Podcasts, Google Play, YouTube, TuneIn and Stitcher, or download episodes directly from SoundCloud. Stay up to date with Clear and Present Danger on the show’s Facebook and Twitter pages, or visit the podcast’s website at freespeechhistory.com. Email us feedback at freespeechhistory@gmail.com.. . .
Americans are more supportive of free speech than any other people. 95 % of Americans think it’s “very important” to be able to criticize the government without censorship and 77% support the right to offend religious feelings. But in 17th Century colonial America, criticizing the government, officials or the laws was punishable as seditious libel and could result in the cropping of ears, whippings, boring of the tongue and jail time. Religious speech was also tightly controlled. Blasphemy was punishable by death in several colonies and religious dissenters such as Quakers were viciously persecuted in Puritan New England. Despite the harsh climate of the 17th century, the boundaries of political speech and religious tolerance were significantly expanded. In this episode we’ll explore: How the crime of seditious libel was exported to colonial America Why peddlers of “fake news” were seen as enemies of the state Why a Harvard student was whipped for blasphemy Why four Quakers were hanged in Boston and many more whipped, branded and jailed How colonies like Pennsylvania, Carolina and Maryland combined religious tolerance with laws against religious offense, How Roger Williams´ ”Rogue Island” and West New Jersey adopted polices of radical religious toleration The dangers of mixing alcohol and politics in Maryland How William Penn promoted religious tolerance and political intolerance How the colonies operated a strict licensing regime to suppress printing How John Wise protested taxation without representation and became “America’s First Great Democrat” You can subscribe and listen to Clear and Present Danger on Apple Podcasts, Google Play, YouTube, TuneIn, and Stitcher, or download episodes directly from SoundCloud. Stay up to date with Clear and Present Danger on the show’s Facebook and Twitter pages, or visit the podcast’s website at freespeechhistory.com. Email us feedback at freespeechhistory@gmail.com.. . . In the 16th Century Spain and Portugal globalized the inquisition by spreading the fight for religious orthodoxy and against heresy, blasphemy and apostasy to the Americas, Africa and Asia allowing inquisitors to pry into the souls of men on five continents. In Episode 17 we try to answer questions such as: How many people were affected by the inquisition? What were the consequences for native Americans? What were the similarities and differences between inquisition in Europe and the different colonies? What where the links between inquisition, racism and anti-semitism? How did the inquisition stop the spread of books and information? Why and when did the inquisition end? You can subscribe and listen to Clear and Present Danger on Apple Podcasts, Google Play, YouTube, TuneIn and Stitcher, or download episodes directly from SoundCloud. Stay up to date with Clear and Present Danger on the show’s Facebook and Twitter pages, or visit the podcast’s website at freespeechhistory.com. Email us feedback at freespeechhistory@gmail.com.. . . In this episode, we join up with historian of science Dr. Michael Shermer to investigate the cross-fertilization between science and free speech. Michael Shermer is a prolific writer on science, philosophy and morality and has appeared in numerous documentaries, talk shows, and TED talks. Among the topics discussed are: When did scientific freedom make its decisive breakthrough? What comes first: Science or free inquiry? How did both Islam and Christianity affect science? What is the relationship between science and free speech as such? Can science be used to suppress free speech? How did Benjamin Franklin infuse the Declaration of Independence with Newtonian science? Dr. Michael Shermer is a Historian of science, Presidential Fellow at Chapman University, founder of Skeptic Society and the Skeptic Magazine and author of Heavens on Earth: The Scientific Search for the Afterlife, Immortality & Utopia, Why People Believe Weird Things, Why Darwin Matters, The Science of Good and Evil, and The Moral Arc. You can subscribe and listen to Clear and Present Danger on Apple Podcasts, Google Play, YouTube, TuneIn and Stitcher, or download episodes directly from SoundCloud. Stay up to date with Clear and Present Danger on the show’s Facebook and Twitter pages, or visit the podcast’s website at freespeechhistory.com. Email us feedback at freespeechhistory@gmail.com.. . . Episode 15 returns to Europe and formative events in 17th Century England, where a mostly forgotten group of radicals demanded a written constitution guaranteeing free speech, liberty of conscience, and democracy. But who were the Levellers? What was the historical context of their radical demands and why were they ultimately crushed by former allies? Listen and find the answers to such questions as: Who was the first English author to demand full religious toleration for both heretics and non-Christians? Why did Charles I and Archbishop Laud cut off the ears of dissenting Puritans? What happens when you try to impose alien religious ceremonies on proud and devout Scots? Why was censorship abolished in 1641 and what were the consequences? What happened at the Putney Debates? How radical were the Levellers’ demands for free speech and liberty of conscience? Did John Milton really become a censor himself? Why did traditionalists refer to pamphlets and books as “paper-bullets?” You can subscribe and listen to Clear and Present Danger on Apple Podcasts, Google Play, YouTube, TuneIn, and Stitcher, or download episodes directly from SoundCloud. Stay up to date with Clear and Present Danger on the show’s Facebook and Twitter pages, or visit the podcast’s website at freespeechhistory.com. Email us feedback at freespeechhistory@gmail.com.. . . Episode 14 leaves the West and heads to 16th and 17th Century India and the Mughal empire. In particular, the rule of Akbar the Great. A century before John Locke’s “A Letter Concerning Toleration,” Akbar developed a policy of “Universal Peace” repudiating religious compulsion and embracing ecumenical debate. We’ll also discover why the history of the Mughal empire still tests the limits of free speech and tolerance in modern India. Among the questions tackled are: Why, how, and to what extent did Akbar abandon orthodox Islam for religious tolerance? How did religious tolerance in the Mughal empire compare to contemporary Europe? How did English travelers get away with openly blaspheming Muhammad, the Quran, and Allah? Was the emperor Aurangzeb really the uniquely intolerant villain that history has portrayed him as? Why do India’s current laws against religious insults hamper modern historians’ efforts at documenting events during the Mughal empire? You can subscribe and listen to Clear and Present Danger on Apple Podcasts, Google Play, YouTube, TuneIn, and Stitcher, or download episodes directly from SoundCloud. Stay up to date with Clear and Present Danger on the show’s Facebook and Twitter pages, or visit the podcast’s website at freespeechhistory.com. Email us feedback at freespeechhistory@gmail.com.. . . In this episode, we do a bit of time travel and leave the 17th century for a discussion of free speech on American college and university campuses today. Our guest is New York University professor Jonathan Haidt, who is a co-author with FIRE’s Greg Lukianoff of “The Coddling of the American Mind: How Good Intentions and Bad Ideas Are Setting Up a Generation for Failure,” which is already among Amazon’s top 20 bestselling books. But in looking at the present challenges to free speech on campus, we do also try to draw parallels with older controversies in order to determine whether the psychological mechanisms at play are similar. Among the topics discussed are: Is there really a “free speech crisis” among American students? The three “Great Untruths” challenging the idea of free speech The mental health crisis affecting students’ ability to handle adversity and disagreement The role of social media Why students’ efforts to shut down speakers at American universities is related to the millennia-old idea of blasphemy What drives tribalism old and new? Whether we should think of words as a form of violence How do we overcome the temptation to reenact the inquisition? Jonathan Haidt is a social psychologist and the author of the New York Times Bestseller “The Righteous Mind.” Among a dizzying range of activities, Haidt is also the co-founder of Heterodox Academy, a large and growing group of professors and students who disagree on many things but are united in their mission to increase viewpoint diversity at American universities. You can subscribe and listen to Clear and Present Danger on Apple Podcasts, Google Play, YouTube, TuneIn and Stitcher, or download episodes directly from SoundCloud. Stay up to date with Clear and Present Danger on the show’s Facebook and Twitter pages, or visit the podcast’s website at freespeechhistory.com. Email us feedback at freespeechhistory@gmail.com.. . .
We enter the early modern age with an expert opinion featuring Teresa Bejan, associate professor at Oriel College, Oxford University and author of “Mere Civility: Disagreement and the Limits of Toleration.” In this episode, Jacob and Teresa will discuss political thought on tolerance and the limits of religious speech in early modern England and colonial America. The episode investigates the writings of intellectual rock stars John Milton, Thomas Hobbes, and John Locke and the less famous but hugely relevant Roger Williams. Among the topics discussed are: Milton’s “Areopagitica” Early colonial religious “hate speech” laws Why Hobbes found “the mere fact of disagreement offensive” The origin, development, and limits of Lockean tolerance Williams’s combination of fundamentalist evangelical intolerance and free speech fundamentalism Why political theory and practice of the 17th century is relevant to modern day controversies on free speech Bejan is Associate Professor of Political Theory in the Department of Politics and International Relations at the University of Oxford and a Fellow of Oriel College. She is the author of Mere Civility: Disagreement and the Limits of Toleration. You can subscribe and listen to Clear and Present Danger on iTunes, Google Play, YouTube, TuneIn and Stitcher, or download episodes directly from SoundCloud. Stay up to date with Clear and Present Danger on the show’s Facebook and Twitter pages, or visit the podcast’s website at freespeechhistory.com. Email us feedback at freespeechhistory@gmail.com.. . . In episode 11 we continue to survey the wreckage after hurricane Luther was unleashed on Europe with the Reformation. When the Reformation mutated and spread across the continent a burning question arose: Can people of different faiths live together in the same state? Should social peace be based on tolerance or intolerance? We look into questions such as How did other Protestant reformers like Calvin and Zwingli react to religious dissent? In what manner did English and continental censorship laws differ? How did the Catholic Church react to the Reformation? Which states were the first state to formalize religious tolerance? How did the scientific and philosophical ideas of Galileo and Giordano Bruno conflict with the religious monopoly on truth and what were the repercussions? You can subscribe and listen to Clear and Present Danger on iTunes, Google Play, YouTube, TuneIn, and Stitcher, or download episodes directly from SoundCloud. Stay up to date with Clear and Present Danger on the show’s Facebook and Twitter pages, or visit the podcast’s website at freespeechhistory.com. Email us feedback at freespeechhistory@gmail.com.. . . The disruptive effects of the internet and social media on the spread of information are unprecedented. Or are they? In episode 10 of Clear and Present Danger, we cover the invention, spread, and effects of the Gutenberg printing press: What significance did this new technology have for the dissemination of knowledge and ideas? Why was the printing press instrumental in helping a German monk and scholar break the religious unity of Europe? What happened when new religious ideas raged through Europe like wildfire? And did Martin Luther’s Reformation lead to religious tolerance and freedom, or persecution and censorship? You can subscribe and listen to Clear and Present Danger on iTunes, Google Play, YouTube, TuneIn and Stitcher, or download episodes directly from SoundCloud. Stay up to date with Clear and Present Danger on the show’s Facebook and Twitter pages, or visit the podcast’s website at freespeechhistory.com. Email us feedback at freespeechhistory@gmail.com.. . .
Our last stop in the Middle Ages is an interview with professor Christine Caldwell Ames, who is an expert on medieval heresy and inquisition in Judaism, Christianity, and Islam. The discussion highlights the similarities and differences between Christianity, Catholic and Orthodox, Judaism, and Islam when it comes to defining and policing orthodoxy. Among the topics discussed are: Was the Medieval Inquisition motivated by worldly power or religious zeal? What effect did the Medieval Inquisition have on ordinary people and local communities? Why has the Spanish Inquisition become so infamous? Was Islamic Spain a haven of religious tolerance compared to the Latin West? Are inquisitions a thing of the past or still relevant in the 21st century? And much, much more. Professor Ames is a department chair at the University of South Carolina, as well as the author of “Medieval Heresies: Christianity, Judaism, and Islam” and “Righteous Persecution: Inquisition, Dominicans, and Christianity in the Middle Ages.” Ames has an MA in Church History from Yale Divinity School and a Ph.D. in Medieval History from the University of Notre Dame. You can subscribe and listen to Clear and Present Danger on iTunes, Google Play, YouTube, TuneIn and Stitcher, or download episodes directly from SoundCloud. Stay up to date with Clear and Present Danger on the show’s Facebook and Twitter pages, or visit the podcast’s website at freespeechhistory.com. Email us feedback at freespeechhistory@gmail.com.. . .
From the High Middle Ages, Europe developed into a “persecuting society,” obsessed with stamping out the “cancer” of heresy. But questions about how this was accomplished — and the consequences of these developments — abound: Why did popes and secular rulers shift from persuasion to persecution of heretics? Why was human choice in matters of religious belief considered a mortal threat to Christendom itself? Why did bookish inquisitors armed with legal procedure, interrogation manuals, data and archives succeed where bloody crusades and mass slaughter failed? How did the “machinery of persecution” developed in the Late Middle Ages affect other minority groups such as Jews? Are inquisitions a thing of a past and dark hyper-religious age, or a timeless instrument with appeal to the “righteous mind” whether secular or religious? What are the similarities between medieval laws against heresy and modern laws against hate speech? We try to answer these questions — and more — in the latest episode of our Clear and Present Danger podcast. You can subscribe and listen to Clear and Present Danger on iTunes, Google Play, YouTube, TuneIn and Stitcher, or download episodes directly from SoundCloud. Stay up to date with Clear and Present Danger on the show’s Facebook and Twitter pages, or visit the podcast’s website at freespeechhistory.com. Email us feedback at freespeechhistory@gmail.com.. . . In our second expert opinion episode, Jacob Mchangama talks with Peter Adamson, who is a professor of philosophy at Ludwig Maximilian University of Munich and host of the podcast “History of Philosophy Without Any Gaps.” We’ll discuss medieval freethinking and freethinkers from both the Islamic world and the Latin West. Where was the soil most fertile for medieval freethinking? What was the impact of Muslim philosophers like Avicenna and Averroes on European thought? And finally, who makes Peter’s list of the top three boldest European medieval freethinkers? Professor Peter Adamson has released over 300 podcast episodes on the history of philosophy, written several books, and published numerous papers on medieval and ancient philosophy. He holds a joint appointment with the Ludwig Maximilian University of Munich and King’s College London. You can subscribe and listen to Clear and Present Danger on iTunes, Google Play, YouTube, TuneIn and Stitcher, or download episodes directly from SoundCloud. Stay up to date with Clear and Present Danger on the show’s Facebook and Twitter pages, or visit the podcast’s website at freespeechhistory.com. Email us feedback at freespeechhistory@gmail.com.. . . In episode 6, we get medieval! Find out why the Middle Ages were as much a period of reason and inquiry as inquisition and superstition. Why was the famous medieval intellectual Pierre Abelard castrated, forced to burn his works, and condemned to silence by the church? How did the combination of Aristotelian philosophy and the development of universities institutionalize reason and science? What are the parallels between clashes over academic freedom in the 13th and 21st centuries? All this and much more in Clear and Present Danger - episode 6! Stay up to date with Clear and Present Danger on the show’s Facebook and Twitter pages, or visit the podcast’s website at freespeechhistory.com.. . .
Why did the medieval Abbasid Caliphs have almost all ancient Greek works of philosophy and science translated into Arabic? How did the long list of medieval Muslim polymaths reconcile abstract reasoning with Islamic doctrine? Who were the radical freethinkers that rejected revealed religion in favor of reason in a society where apostasy and heresy were punishable by death? And why are developments in the 11th century crucial to understanding modern controversies over blasphemy and apostasy, such as the Salman Rushdie affair and the attack on Charlie Hebdo? Find out in episode 5 of Clear and Present Danger – A History of Free Speech: The Caliphate. Stay up to date with Clear and Present Danger on the show’s Facebook and Twitter pages, or visit the podcast’s website at freespeechhistory.com.. . . In our first expert opinion segment, Jacob Mchangama talks to Emeritus Professor of Greek Culture at Cambridge University Paul Cartledge. With his intimate knowledge of ancient Greece, we dive deeper into the concepts of free speech and democracy in Athens that were discussed in episode one. What are the differences between free speech in the Athenian democracy and free speech in a modern liberal democracy? What limits did religion set for Athenian free speech? Was Plato a totalitarian? And was the trial of Socrates mostly religious or political? The discussion also explores the differences between Athens and republican Rome, why free speech was alien to Sparta, and the rather condescending attitudes of the American Founding Fathers toward Athenian democracy (shame on you for defaming Pericles, Alexander Hamilton!). Cartledge has written extensively on ancient Athens. His authorship includes among many titles, the critically acclaimed “Democracy: A Life” and “Ancient Greek Political Thought In Practice.” Stay up to date with Clear and Present Danger on the show’s Facebook and Twitter pages, or visit the podcast’s website at freespeechhistory.com. Email us feedback at freespeechhistory@gmail.com.. . .
Why did the polytheist Ancient Romans persecute the followers of the new Jewish sect of “Christians” in the first three centuries AD”? How high was the price that Christians had to pay for casting away their ancient religious traditions for the belief in salvation through Jesus Christ? Did Roman Emperor Constantine end religious intolerance with the Edict of Milan? And why did the Christians persecute the pagans – and each other – once Christianity became the state religion of the Roman Empire? Why were temples and libraries destroyed and the female mathematician Hypatia killed by violent mobs? And did Emperor Justinian really end antiquity when he closed the Academy in Athens? Find out when we discover how religious persecution and violence impacted lives, learning, and liberty of conscience in the period from the trial of Jesus to the age of Justinian. The Age of Persecution. That’s episode 3 of Clear and Present Danger: A History of Free Speech. Stay up to date with Clear and Present Danger on the show’s Facebook and Twitter pages, or visit the podcast’s website at freespeechhistory.com.. . .
Rome was the most powerful empire in antiquity. But were the Romans free to speak truth to power? Did history’s first successful Women’s March take place in Rome? And who came out on top when the words of Cicero clashed with the ambition of Caesar and armies of Octavian? Why did historians and astrologers become endangered species when the Republic became an empire? Find out in episode 2 of “Clear and Present Danger: A History of Free Speech”. Stay up to date with Clear and Present Danger on the show’s Facebook and Twitter pages, or visit the podcast’s website at freespeechhistory.com.. . . The democracy of Ancient Athens was the birthplace of equal and uninhibited speech. Or Isegoria and parrhesia to the Athenians. Jacob Mchangama guides you through how oratory was central to the idea and practice of Athenian democracy. What Athenian style free speech entailed for ordinary citizens, comedians, philosophers, and orators. How oligarchic coup d’etats twice drowned Athenian free speech in blood and repression. The extreme methods used by Demosthenes to become the greatest orator of antiquity. And of course: the trial of Socrates: Was he a martyr for free speech or an impious and seditious enemy of democracy? So the following episode is an attempt to bring to life a pivotal but often forgotten period as we embark on the first stop of what I hope will be a long journey together through the history of free speech. Stay up to date with Clear and Present Danger on the show’s Facebook and Twitter pages, or visit the podcast’s website at freespeechhistory.com.. . . Episode 0: Why free speech? Only 13% of the world’s 7,4 billion people enjoy free speech. 45% live in countries where censorship is the norm. Still, more than half the world’s population across cultures and continents think free speech is very important. But why is that? Where does the principle of free speech come from? How has it been developed over time? Why have kings, emperors, and governments killed and imprisoned people to shut them up? And why have countless people risked death and imprisonment to express their beliefs? And what can people in the digital age learn from past conflicts over where to draw the line? In this Prologue, Jacob Mchangama explains his motivation and core beliefs on why and how he will take on this endeavor to explore the history of free speech. Don't forget to subscribe to the series!. . .